Delaware Valley homeowners in search of the “vacation home” of their dreams often wind up turning to a man named Steven Katz. Katz doesn’t work in real estate per se, though his vision can help transform an existing outdoor property into an oasis that substantially increases a home’s value—essentially creating a sanctuary in one’s own backyard. 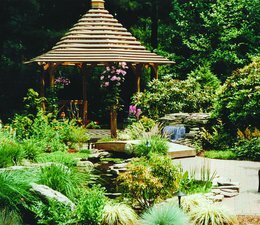 For more than three decades Katz’s Delaware County-based company, Land & Seascapes, has been dreaming up and handcrafting enchanting water gardens, patios and festive outdoor environments to complement a homeowner’s lifestyle. In light of current economic trends, which have more Americans investing in their homes in lieu of moving elsewhere, Katz and his team are busier than ever. Land & Seascapes’ outdoor masterworks not only add value and breathe new life into clients’ homes but also enable homeowners to maximize the enjoyment of their properties all year long. For example, serene water gardens and cascading waterfalls can quiet the mind even in the winter months, while skillfully designed patios with walkways and planters provide limitless options for color, shape and bloom in each season. Studies suggest landscaping/hardscaping should equal 20 percent to 30 percent of a home’s value—but it’s difficult to put a number on beauty and functionality. Well spoken and articulate, Katz is a certified aboriculturist and horticulturalist who received his training at Michigan State and the Universities of Tampa and London, with continued studies at Longwood Gardens in Kennett Square and The Japanese Ceremonial Gardens of Fairmount Park. Satisfied clients have referred to him as “a true artist” whose work and creativity far surpass their expectations; much of his business comes from referrals and repeat customers. Whereas some professional landscapers have chosen to subcontract much of their work, Land & Seascapes provides hands-on personalized service, from consultation and design to on-site supervision. Katz’s firm commitment is shared by his sustained team of specialists. “The crew and I communicate almost telepathically now,” he says. Upon a first visit with a potential client, Land & Seascapes provides a well-planned design concept, pricing information and professional references from past clients. Katz pays expert attention to each customer’s preferences and expectations to arrive at a concept the homeowner will love for years to come. Once the Land & Seascapes team begins work on a client’s property, it focuses all its energies exclusively on that site—one project at a time. Furthermore, Land & Seascapes maintains an on-site satellite office that ensures composed and considerate work, all while staying on schedule and within the client’s budget. Land & Seascapes can design an outdoor environment to thrill any client, and homeowners can count on Land & Seascapes for bi-annual professional maintenance of their entire landscaped settings. Likewise, Katz and his team can create a properly installed landscape requiring only two annual maintenance visits—once in the spring and once in the fall, for pruning, mulching and feeding, and either preparing plants for summer or tucking in for cold weather. The company’s website, LandandSeascapes.com, offers an array of visual samples of how any number of enhancements, from ornamental rock and water gardens, pools, ponds and waterfalls, to outdoor lighting, patios, gazebos, bridges and arbors, can enhance a property’s personality. No pond or water-feature project is too complex. In fact, Katz has been furthering the trend of homeowners devoting parts of their property to larger, functional water features he describes as “swimming ponds,” which combine all the benefits of a traditional swimming pool with the natural tranquility of a pond, yet with minimal maintenance. Imagine gazing out the window year-round at a serene, flowing environment—and no swimming-pool cover. With spring now unfolding in the greater Philadelphia area, Land & Seascapes customers have been watching their properties bloom with the likes of Mediterranean heathers and winter jasmines, followed by witch-hazels, forsythias and then star magnolias, redbud, azaleas and rhododendrons—not to mention the wave of seductive perennial pastels. Others have benefited from charming blue bells of Jacob’s ladder and bright bursts of lemon and sapphire crocuses, which yield to soft sunny daffodils, delicate white candytuft and decorative purple allium. With Land & Seascapes, the year-round options are almost limitless. 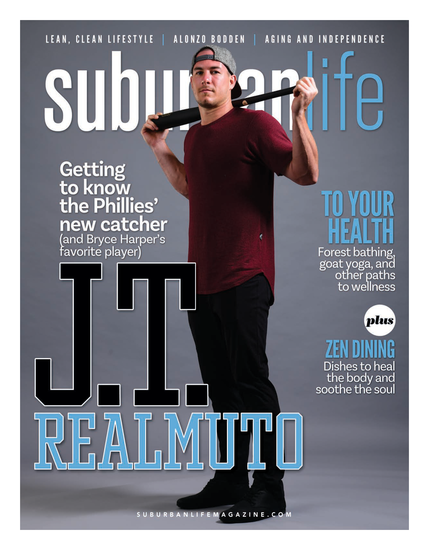 To give potential clients a better understanding of these options, Katz has extended a personal invitation to Suburban Life readers to visit his “Walkabout,” also known as the Garden Showcase of Possibilities. Within minutes of almost any home in the Delaware Valley, the custom-designed and custom-built garden showcase took almost a decade to complete, and is quite literally his visual résumé: deep red salvia mingling with washes of pale fritillaria; illuminated flagstone pathways leading to defined sitting areas edged with flowering perennials; and rock gardens flush with ferns and windflowers weaving around soothing waterfalls. In addition, nighttime visitors can tour the landscape-lighting showcase to choose from a variety of 350 specialty fixtures. For an immediate conversation, call Steven Katz on his cell phone at 610-996-3248. Jill Yris is a professional writer based in Doylestown.